​​​​​HOUSTON – Houston’s energy-dependent economy may be poised for a comeback in 2017, but experts say recovery is still a ways off for the city’s multifamily market. 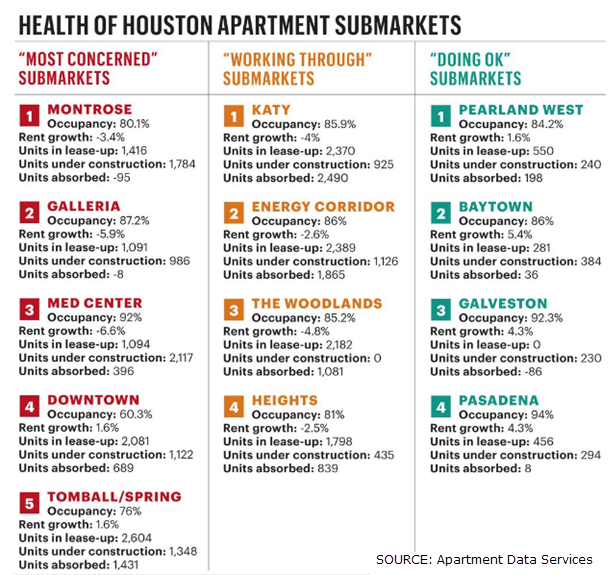 Bruce McClenny, president of Houston-based Apartment Data Services, and other industry leaders issued a mixed forecast during the Houston Apartment Association’s “State of the Industry” event recently. Over the past three years, developers built 58,000 apartment units, flooding the Bayou City with a glut of Class A apartments. With another 59 apartment complexes totalling 15,228 units still in the pipeline, Houston’s apartment supply far exceeds demand, McClenny said. Submarkets near the petrochemical boom on the east side of Houston have continued to post strong rent increases during the downturn. Baytown, Galveston and Pasadena all have occupancy rates of more than 90 percent and rent growth of more than 4 percent in 2016. ​See ​Houston Area Multifamily Research.